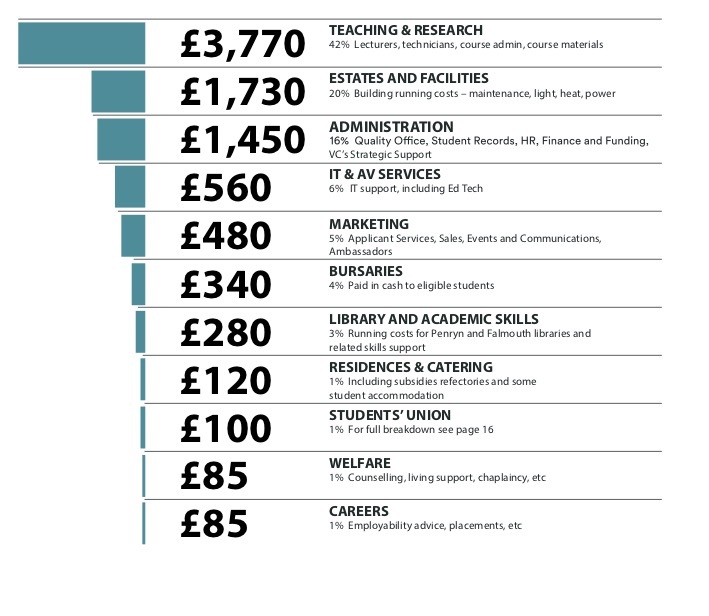 Our latest publication shows where student fees really go. As such, it has the potential to be one of HEPI’s most controversial reports ever. That is unintentional. We never stoke controversy for the sake of it. But exposing the uses to which England’s £9,250 undergraduate fees are put reveals things some people regard as uncomfortable truths best left in the dark. When you look at where students’ fees get spent, one finding is particularly noteworthy. According to university accounts, typically only around 45% of each student’s fee goes on the direct costs of teaching – such as staff salaries. But this does not mean the rest is wasted. Most of what’s left is also spent on areas that benefit students. After teaching, the next biggest cost is buildings. Then come other high priorities like information technology, student support services (such as counselling and careers advice), widening participation activities and the students’ union. Beyond the proportion of fees that go on teaching, another revelation with the potential to get people hot under the collar is the exposure of cross-subsidies from fees for lower-cost courses, like History, to higher-cost courses, like Physics. Moreover, undergraduates sometimes subsidise postgraduates. At face value, this can all seem a trifle unfair. However, students voluntarily choose to attend broad-based universities with lots of disciplines on offer, where teaching and research take place side by side, because they know it adds to their student experience. And, if laboratory subjects and some postgraduate courses cannot be run properly on the income they currently attract, that is surely an argument for boosting the remaining teaching grant from government, which is meant to fund such shortfalls, or easing the path for international students, who more than pay their way. It is simply naïve to expect any institution as large as a university to have no areas that make a loss and none that makes a surplus. After all, some universities turnover more than a billion pounds a year. Yet uncovering the internal finances of higher education institutions and assigning costs to individual students can be unsettling for other reasons too. Higher education is about much more than money. Cost and value are not the same. There is no perfect way to break the numbers down. That is all true. But, to me, people who say thee data should remain private are like the medieval canon Henry Knighton who opposed the translation of the Bible into English because it would mean ‘the jewel of the church is turned into the common sport of the people’. When three-quarters of students want to know where their fees go and when policymakers cannot decide what fee level is the right one, it is crucial to build better evidence. This can be tricky but academics are used to dealing with difficult data and should be better able that anyone else to set hard-to-read numbers in their true context. This all helps to explain why higher education institutions have been under pressure from external forces for a long time to tell their students where fees go. I managed to push a commitment to greater transparency into a government white paper back in 2011 during my time working in Whitehall, but it didn’t survive the Coalition’s wrangling. In my view, they are broadly correct for three reasons. First, if students are picking up much of the tab, they have a right to know what they are paying for. Secondly, without digestible information on how university finances work, evidence-light claims about universities – such as the idea they are ‘awash with cash’ – gain a currency they do not deserve. Thirdly, transparency forces policymakers who claim university fees are too high and should be reduced (or abolished) to say which things universities currently do they want to be cut. they are expected to provide bursaries when the maintenance support package proves insufficient. Universities are also expected to fund things like new teaching facilities from fees when such things used to be paid for by direct public spending. Very broadly speaking, our polling suggests students are content with much of this. The places where fees go are roughly in line with the priorities of students. They are not keen on their fees being used for recruitment and marketing, nor on community projects. These activities can be central to a university’s future success and its value to society but the fact that students do not want their fees spent on them is not a huge surprise. This is because the student funding system we have has been built on rhetoric that emphasises the personal salary benefits of earning a degree. In the next few weeks, we will learn whether rumours of a hefty cut in the tuition fee cap are likely to come true. If fees are cut without a commensurate increase in public spending, universities will be forced to reduce their activities. They are most likely to cut things that are not central to an institution’s core mission or which do not chime with current students’ priorities for their fees. In other words, the price for some catchy headlines about lower fees is likely to be less community engagement, less widening participation activity as well as a less intense learning experience – the very opposite of what governments usually profess to want.